Ruth Johnston’s mailbox was overfilled with holiday cards and her heart with gratitude. 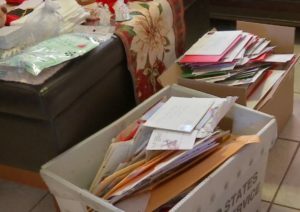 As of Saturday, the 53-year-old woman has received more than 500 holiday cards and presents from across the nation. Last week, Johnston’s caregiver Joy Thompson asked members of the Facebook group “Pay it Forward Lehigh Acres” to send Johnston some Christmas cheer. Johnston, who often checked her mailbox for an uplifting greeting, has lived in several mental health homes over the past years and has no family living nearby. “I never imagined that there were so many good people out there. My heart just burst you know the joy for her,” Thompson said. Johnston plans to hang the cards on the wall as a reminder of a special Christmas. Previous articleLIVE: Could Harriet’s first egg hatch for Christmas?